The Rev. Debra Andrew Maconaughey of St. Columba Episcopal Church in Marathon, which is rehabbing a 16-unit apartment complex. In the Florida Keys, the challenges of finding an affordable place to live were made much worse after Hurricane Irma destroyed or severely damaged thousands of homes in September 2017. A number of nonprofits and faith groups came in to help after the storm. One church in Marathon was already there — and is taking a big step in providing housing for people in the Keys who lost their homes. Right after Irma crossed the Lower Keys as a Category 4 hurricane, St. Columba Episcopal Church in Marathon brought in 22 RVs to serve as emergency housing. The RVs were placed from Key West to Islamorada. But that was a short-term solution. The Rev. Debra Andrew Maconaughey describes her church's affordable housing project in Marathon. "Early on, about in November, we started thinking we need to find a place to build or we need to find a way to help people have some high quality housing at an affordable rate," said the Rev. Debra Andrew Maconaughey, rector at St. Columba. She found an old apartment complex for sale. It had been empty for a few years but was originally built in the 1960s, out of concrete block. "It's built like a tank," she said. She said she liked the building right away — the Miami Beach feel to the design and the spaciousness of the 16 one-bedroom apartments. They have terrazo floors, solid ceilings — and walk-in closets. "And, you know, you don't see that every day in the Keys," Maconaughey said. The rector from St. Columba Episcopal Church says she liked the apartment complex's Miami Beach feel as soon as she saw the place. New galley kitchens are being donated by IKEA. And the apartments all have large openings, which will be fitted with new hurricane-proof windows. 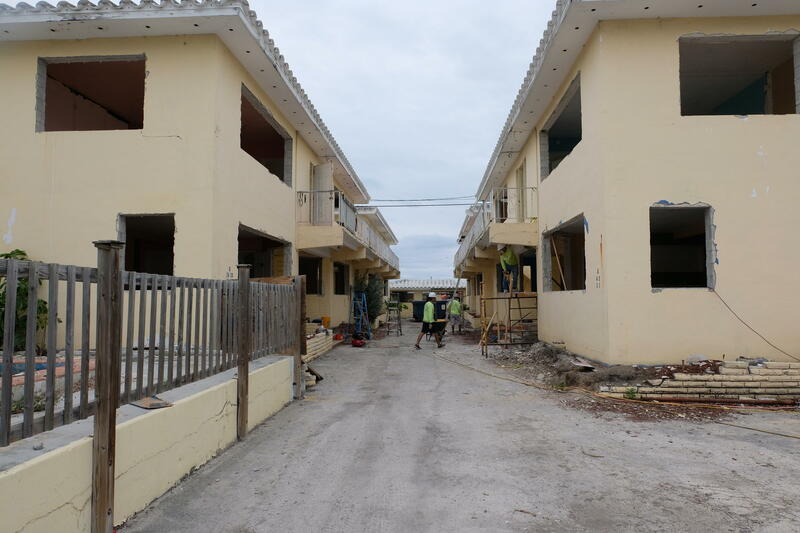 Maconaughey said they're aiming for rent between $800 and $900 — a truly affordable amount in the Keys, where much of what is labeled "affordable housing" rents for twice that or more. "We're nonprofit, so we don't have the profit motive," Maconaughey said. The church also got help from Episcopal Relief and Development, the church's agency that provides help after disasters. The relief agency gave St. Columba $75,000 right after the storm and then asked what else the church wanted to do. "And I said, 'Well, I really want to buy this apartment complex.' And that's a little bit out of their comfort zone," Maconaughey said. "But we got them to agree that this was a good idea. So they provided the initial financing for part of the down payment. We also used some of our own money at the church." The agency gave the church a $225,000 grant toward the $320,000 down payment on the apartment complex, which cost $780,000, Maconaughey said. The building's seller is holding the mortgage. The apartments should be ready for tenants later this year. Maconaughey said she's hoping for June, though others involved in the project tell her September is more realistic. When the renovation is closer to completion, Maconaughey said the church will work with local nonprofits to help select tenants. People who live and work in the Middle and Lower Keys and lost their homes in Hurricane Irma will get top priority, she said. She says the rents will cover the maintenance and mortgage payments for the complex. "Our goal will be to retire the mortgage in three years," said Maconaughey. "And then, if we're successful at this, which I think we will be, we're going to do it again." A month after Miami leaders passed an affordable housing mandate for new residential buildings in parts of Downtown, a public redevelopment agency is launching its own efforts to address the city’s affordability crisis. The Omni Community Redevelopment Agency is investing more than $3 million to help rehabilitate a dilapidated affordable housing complex in Overtown. The project known as 16 Corner is part of a plan to spend more than $100 million by 2045 to improve and increase affordable housing across the greater Omni area. More than 100 supporters of the nonprofit The AIDS Healthcare Foundation rallied in front of Fort Lauderdale City Hall Monday night. Chanting,"Healthy housing for all!" the group wore white T-shirts that said, "Love Thy Neighbor." The foundation is trying to build a 680-unit micro-apartment tower in the city's downtown but has met opposition from nearby residents who expressed concern over lack of services for potentially formerly homeless people living in the building, and about the size and density of the development. When Hurricane Irma slammed across the Lower Keys as a Category 4 storm last year, it hammered what passes for affordable housing — mobile homes and older structures that weren't elevated. For people who are left with a piece of land but not a lot of money to rebuild, Monroe County plans to commission four tiny homes as a pilot project.